My Gluten Free Adventures in Málaga, Spain. My wonderful amiga Rose has spent the last year living in Spain with Erasmus, making me jealous of her sun filled days and mega tan! As she turned 21 on the 29th of May, I decided to buy her the best present I could think of….ME! I’ll try and make this more about the food rather than all the wonderful things I saw on my galavanting around the city of Málaga! I started my journey in Leeds, where I had like 5 hours between my train getting in and the bus I needed to get to the airport, so I decided to treat myself to a date with The Great Gatsby (Its blooody brilliant isn’t it?). 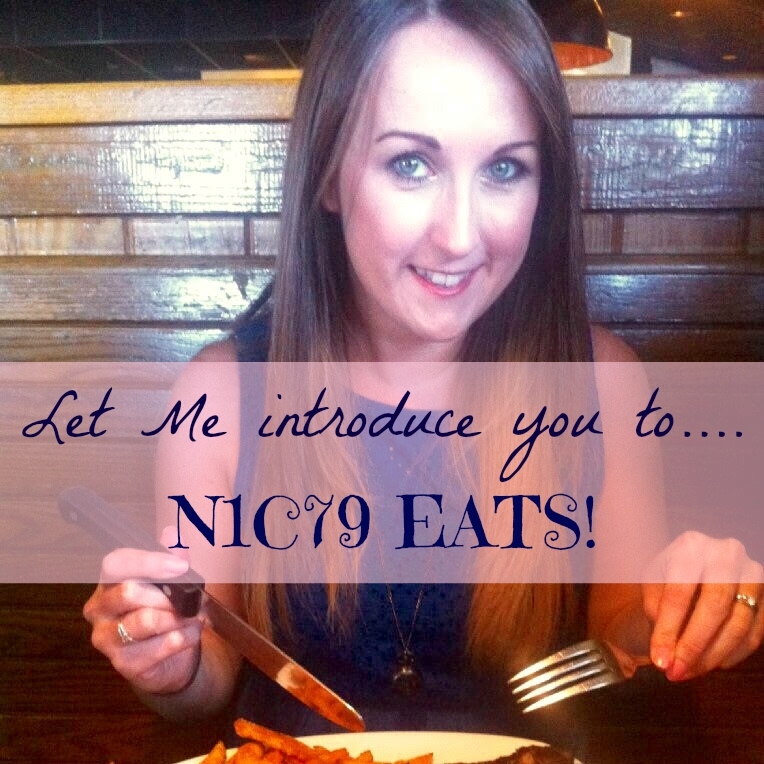 Hungry and raring to go, I sat down at my lonely table for one at TGI Fridays. I ordered a medium rare steak with mini stuffed jacket potatoes and the house salad, apart from the shock the the salad wasn’t really a salad but a bacony cheese concoction I was very impressed with my meal! 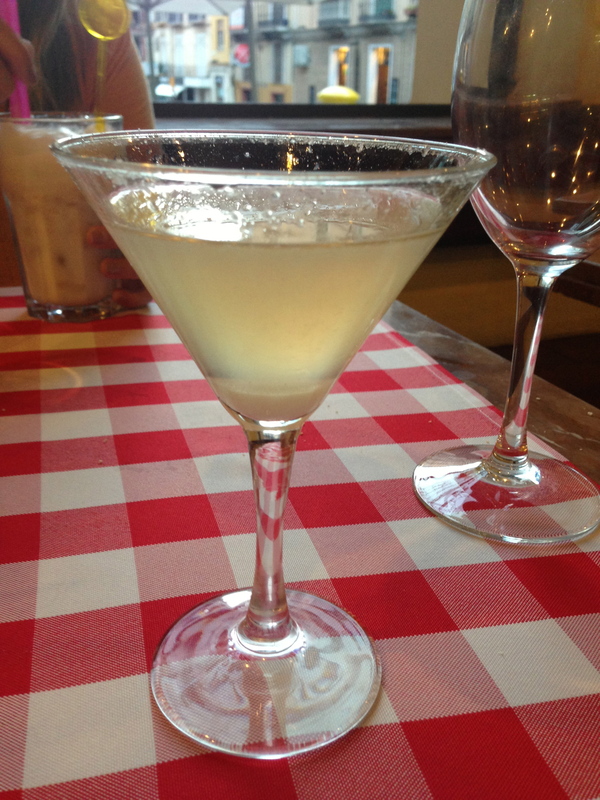 I was also pleased with TGI Fridays efforts to create a gluten free menu (and a lactose free menu) which you can find here. I felt like I could never be hungry again, so at the airport I ordered myself a (very expensive) glass of wine and started my holiday in style, watching ‘Would I Lie To You’ on my iPad and letting my loved ones know I would soon be departing to sunny Málaga! I don’t really count the first day as a day seeing how I landed at midnight and didn’t eat anything…..So we start the Spanish Gluten Free Adventure on Tuesday 29th May….Roses Birthday! Day One: We woke up bright and early, Rose made a super protein fill breakfast of scrambled egg and salmon ready for our fun filled day up in the mountains at EL Chorro. Rose getting her drink on! Happy 21st! After a wonderful day in the sun, we got the train back to Roses quaint little flat where I made myself some Gluten Free Pasta (about €2.50) with onion, chopped tomatoes and chorizo. And fell asleep around 9pm. Not really the party night we expected for a 21st birthday but had a wonderful day regardless full of delicious food! Day Two: Wednesday morning I made myself a scrambled egg sandwich (one of my favourites) with Bimbo Gluten Free bread (you can miss it in the Gluten Free section in the supermarket as it has this creepy bear on the front), the bread wasn’t too bad. It wasnt as good as the bread you get in England, such as Genius, but for Spain it was good. Rose said it was just as good as the plain white slice she gets, its just a bit small. During the day I went for a gander around Málaga as Rose has uni, went to the Picasso Museum and ordered myself a lovely Nestlé Frappelatte in El Cafe Centro, right in the heart of Málaga underneath Roses flat…they’re really expensive and not as good as the proper coffee you get in Spain but lovely and cold! 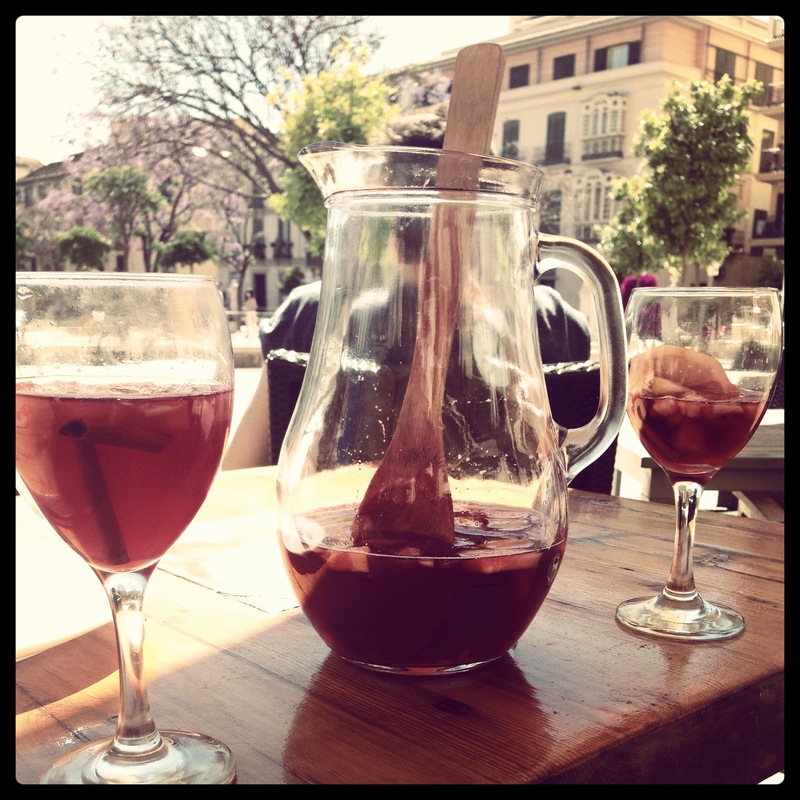 In the afternoon Rose and I went for Merienda in La Plaza where the staff will tell you what is Sin Gluten if you ask nicely, we shared Chorizo, Rosemary Chicken Skewers and Potato Wedges with Pesto Mayonnaise tapas and a big jug of Sangria! The best way to spend a hot afternoon. There was such a lovely view over the square and a busker played traditional Spanish music in the background. We casually made our way back and stopped at the supermarket where we decided to make paella for dinner! Its not how you would traditionally make it but we liked it…here is our rough recipe and we sort of made it up as we went along…. Beth and Roses Chicken and Chorizo Paella- Served Two. A Few Florets of Broccoli chopped up quite small. We chopped everything up and stir fried it in some olive oil, adding some salt, pepper and fish seasoning, stirring occasionally until the chicken is almost cooked and the onions are soft. Stir fry the rice for a couple of minutes until it is nicely coated in all the oil, add the sachet and add the water a little bit at a time, as you would if you were making a risotto. And it worked beautifully! It was delicious! Especially seeing as we were a bit tipsy when making it after that huge jug of sangria! We ended up napping really early again, so spent the evening in watching Mamma Mia. Day Three: Not feeling eggs again that day, I made a weird thing for my breakfast…I microwaved some banana and sugar onto some Gluten Free bread…sounds strange, looked strange but tasted really nice. I did spend about an hour that morning looking for somewhere that did Gluten Free pastries, The supermarket did but they were very expensive, around €4 for two, so that was slightly disappointing but had a energising Café con leche (Coffee with milk) ready for a day at the beach. 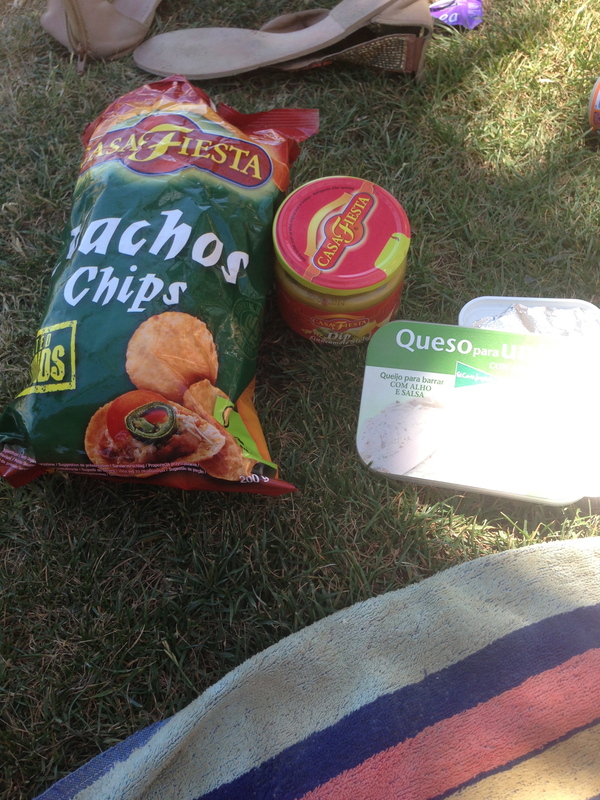 As a snack during the day, we bought some nachos, guacamole and cream cheese and ate them on the beach. After sunbathing on Malaqueta beach, we walked along the seafront to the marina, a very posh looking place with a wonderful lighthouse (I LOVEEEEEE LIGHTHOUSES) and loads of shops and restaurants. We stopped at Saloniki, a lovely Greek Resturant overlooking the harbour. After spending last summer in Crete, I’m well accustomed to Greek food….I love it all! We both ordered a Greek Salad with Chicken and a side of Tzatziki, it was so light and refreshing and perfect after a day in the Sun. We carried on walking down the marina, through the gardens and walkways all the way back to Roses flat. We actually made it out this night, after pre-drinks, we made our way to one of the local bars. I have to say, and I think I speak for most of the Málaga Erasmus Students when I say this, The night life isn’t the best…overcrowded bars with weird music from like 10 years ago, nevertheless it was still pretty fun. Day Four: Thinking the chicken wouldn’t last another day…Rose and I decided to make chicken and Asparagus for breakfast..it was super protein rich and really great! After a day of adventuring around Málaga, We went for some crazy raisin wine at EL Pimpi, a bodega that overlooks the Roman Amphitheatre, and some olives. The olives were young and quite a strange sensation and taste, I liked them but Rose wasn’t so keen. The wine on the other hand, we both agreed was delicious, you couldn’t have more than a glass because its very sweet..I’m not entirely sure what kind of wine it was or what it is called, but it was yummy! Afterwards, we walked to Il Laboratorio, Roses Favourite restaurant in the city, delicious italian cuisine served in Spain. 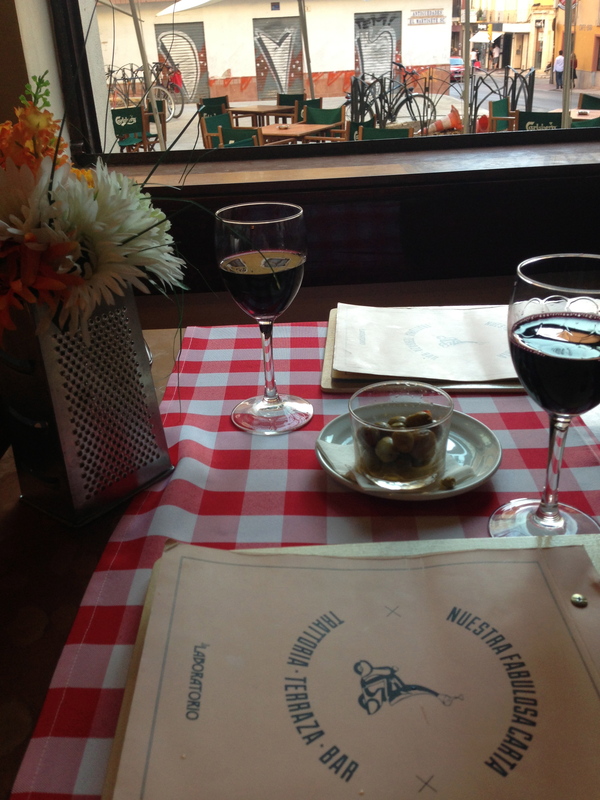 We ordered two red wines, which again came with olives…these ones were much better! 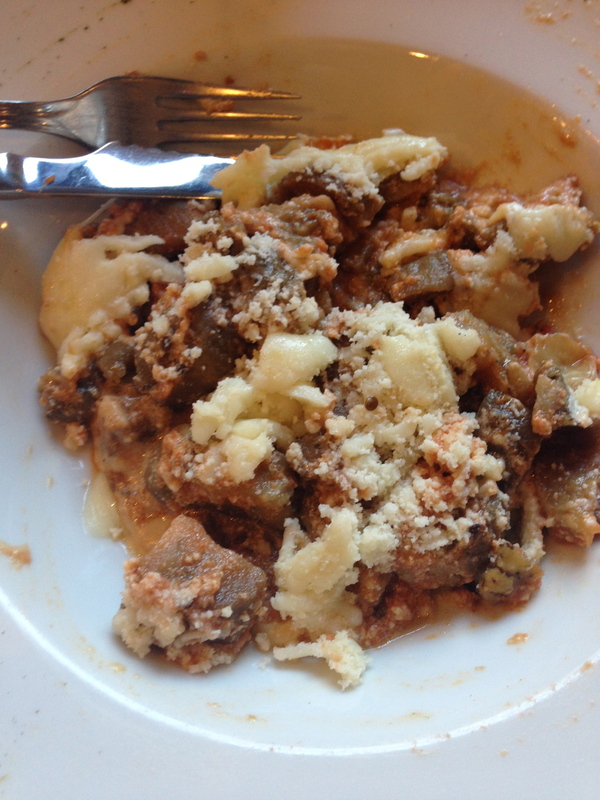 I ordered an aubergine bake, with tomato sauce and cheese. It was much tastier than it looks in the picture! Rose ordered an amazing half burger with chips that was huge, I was quite jealous at the time….mine was supposed to be a starter but I ordered a large one and I was kinda hungry after. Instead of a desert I decided to be like all the girls off Friends and get a margarita but it was too salty and I didn’t really like it. I should of got a White Russian like Rose (I had terrible food envy! ), However it was a wonderful restaurant, nice location, cute decor and friendly atmosphere! I didn’t feel very well when I got back, I think I was dehydrated as I drank more alcohol than water that day, feeling tired and sick I decided to stay in and missed the hippy party, which I was really looking forward too. Day Five: I learned how to make toast without a toaster (they had one in the flat but it was all gluteny), I heated a pan up with no oil and dry fried it on both sides until toasted. it produces a lot of smoke but made toast! I had this with a fried egg and some chopped tomatoes. Rose was either revising or having an exam or at uni I cant quite remember, but I had more adventures around Málaga, having a wander around the amazing Moorish Fort, stopping for a freshly squeezed orange juice at La Plaza. I met up with Rose, where we climbed up to this beautifully high viewpoint looking over the whole of the city, it was beautiful! 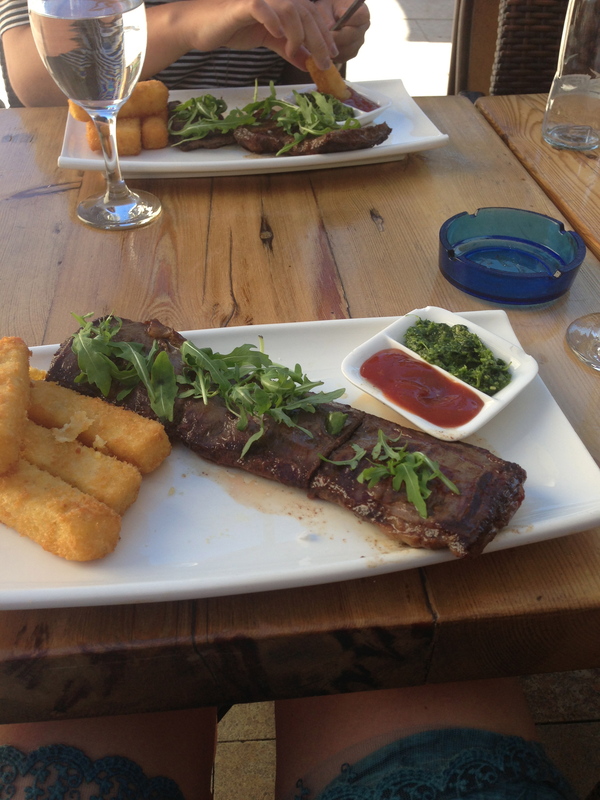 Then made our way to Terra Sana where we both ordered a Rare Steak Skirt, served with Polenta Chips, It was a huge piece of meat, very tasty but very rich…I throughly enjoyed the polenta chips and intend on making some as soon as I can! Terra Sana is a weird restaurant with a weird menu, I don’t really know why, its just a bit eclectic and eccentric…but that isn’t always a bad thing. Day Six: Oh what an excellent day! We spent it in a water park nearby and had soooo much fun! I started the day with some Eggy Bread (for those who don’t know, Eggy Bread is plain bread soaked in beaten egg and fried) and made my way to the train station. Unfortunately there had been a mix up and I was at the wrong one but never mind! We got there in the end! I popped to the supermarket on the way and bought some ‘Polomitas’, they are my favourite spanish crisps, kind of like soft buttery popcorn! They are yummmmmy and addictive! The only thing available to eat at the water park were chips, so I ordered them. I really shouldn’t have because I didn’t know if they were definitely Gluten Free, I felt guilty towards myself straight away but fortunately I wasn’t poorly. It was a very silly thing to do and I had a stern word with myself afterwards! It was such a long tiering day and after spending so much money we couldn’t bare to go out for dinner so I made Rose and her lovely Flatmate Ciara Pasta Bolognese with Garlic Bread and some celebratory wine! Day Seven: I had a super healthy breakfast smoothie at El Último Mono, a homemade hotdog sandwich for lunch and many coffees, One at Le Jardin Cafeteria and another at El Cafe Centro. The waiter in Le Jardin Cafeteria was so lovely, he let me leave without paying to go get change, trusting that I would come back…which I did of course! For dinner Rose and I went to a lovely restaurant called El Patio Bodega, where we ordered a mixed Paella, with Chicken, Little Squid, Lobster, Prawns and Clams. It was incredible, it had a slightly more meaty and gravy taste than I am used to in Paella but it was really good! I would highly recommend everyone going! Apparently its the place all the Erasmus students take their parents and guests, it was a little bit different and I liked it! We then decided to go for a walk around town after sunset and you got a whole new perspective, It was sooo pretty at night! Day Eight: I made scrambled egg on toast for my breakfast and popped into the gorgeous smoothie shop again, this time I got an Orange and Mango Smoothie and made my way across to the other side of town to explore. I bought Chorizo and Tortilla (my favourite spanish lunch) from the supermarket and ate it back at Roses flat while I read on her balcony. 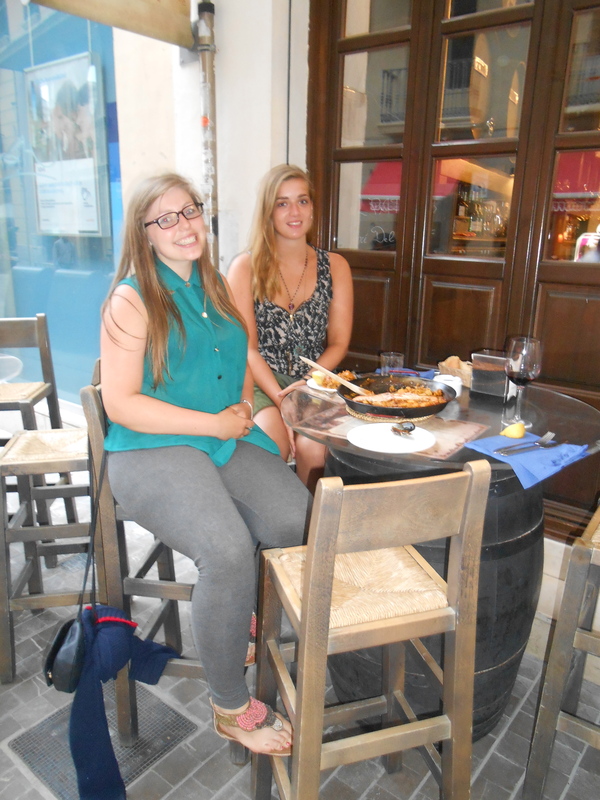 Later afternoon, it was merienda time, and it was back to La Plaza for more delicious tapas. Rose told me off for ordering what I ordered last time, saying I was being unadventurous but I loved it last time! I may as well love it this time! Luckily it was happy hour! So we started ordering cocktails! 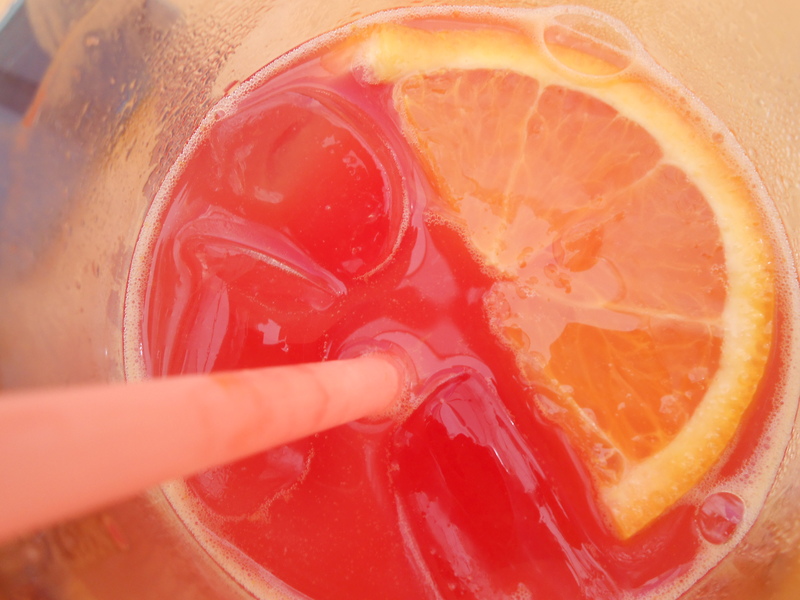 I went for two tequila sunrises…which ended up being very different colours! We went back to the flat to get changed, and got ready to hit the Marriot Hotel roof terrace on the 15th floor! It was super high and the few was incredible, ordering a bottle of Cava (which was the cheapest thing on the wine list) we drank our bubbly in high style! All McDonalds in Spain (And France I believe) offer gluten free options which are highlighted as being suitable for Coeliacs. Now obviously I am not suggesting that when we all fly to Spain and we should only eat McDonalds…I am saying its an excellent treat and you will thoroughly enjoy it! The bread is very good, soft and surprisingly normal! It was excellent and I loved it! I don’t care if thats sad! Day Nine: Boooooo…. The last day! 😦 We decided it would be an excellent idea to spend my last day at the beach. I made myself an omelette with asparagus and onion but it broke and looked hideous so I’m not going to show you my photo but it tasted wonderful! After only being on the beach for an hour, it got really cloudy so we walked back, picked up an ice lolly from this cool ice lolly shop…sadly I can not remember what it was called…but it was decorated bright green and was fantastic, the staff were very knowledgeable about Gluten Free and advised me against eating the lollies with chocolate on, so in true Beth style…I ordered a mojito one! We spent the rest of the afternoon chilled out at another roof terrace on top of a hostel drinking coffee and Fanta. 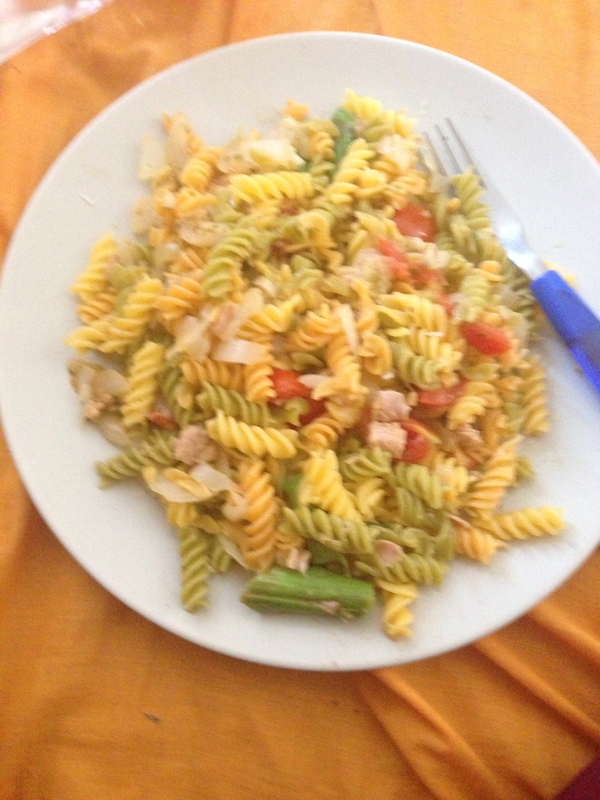 After getting stressed about my flight, Rose let us leave and made our way back to her flat, where she made me a delicious tuna pasta…which was lovely despite her telling me it looked awful! With my belly full I made my way back to the airport and set off home! 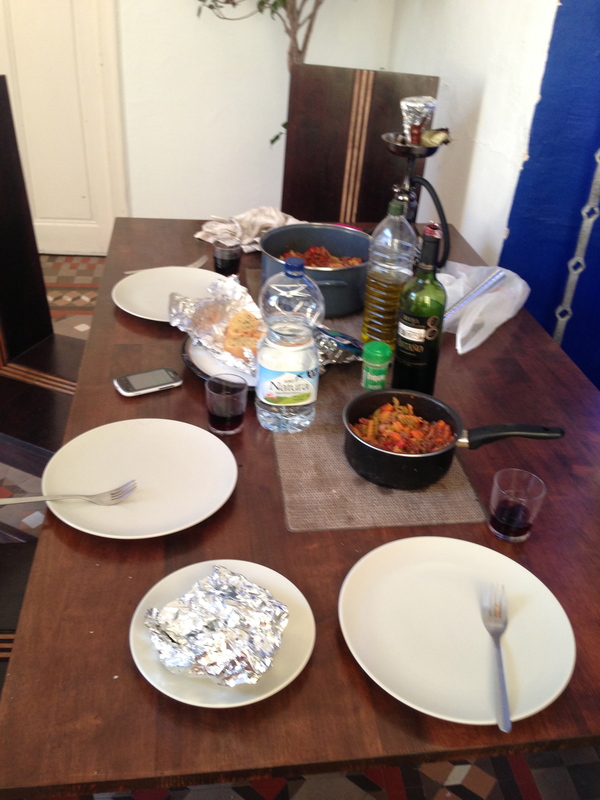 I had a fantastic 9 days in Málaga and enjoyed some wonderful food with some wonderful company! 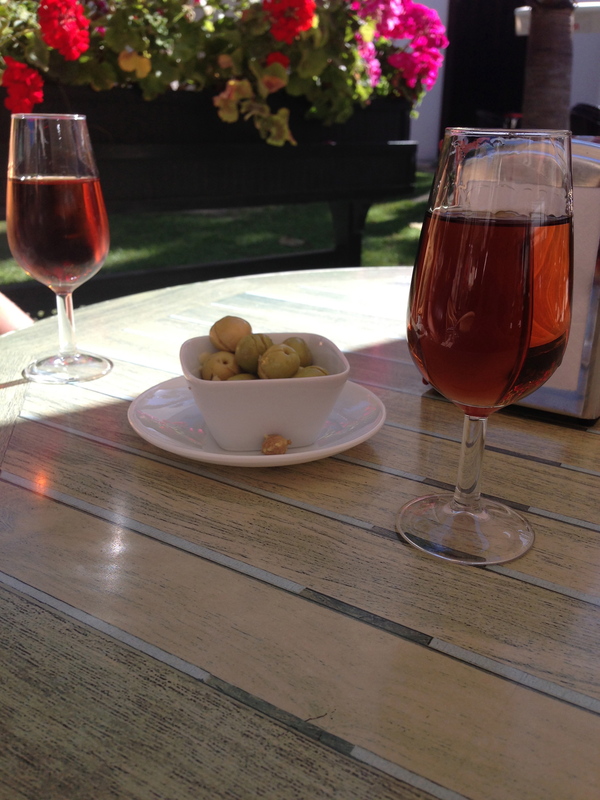 Thank you Rose for looking after me and letting me stay…Thank you Málaga for your wonderful sights and delicious food. Spain is an excellent country to eat Gluten Free in….the Spanish are very clued up on “Coeliacos” and their requirements…so you’ll have no trouble buying “Sin Gluten” whether you are shopping in the supermarket or eating out!